When I have a patient tell me that they have already had their doctor run labs and they are “normal,” I cringe. 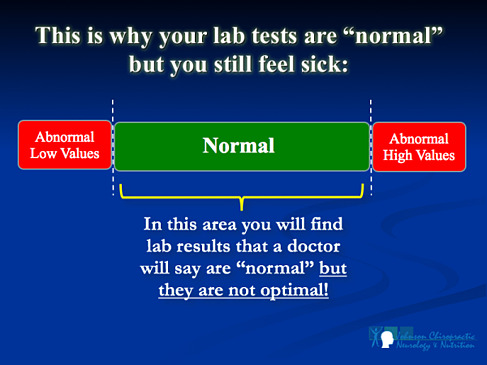 Rarely are the labs normal from a functional perspective. The pathological lab values provided on the lab results are actually based on a “bell curve analysis” of all the people that have been to the lab over “x” amount of time (usually in the past year). If you go to the same lab in two different cities you will find that the reference ranges are actually different. 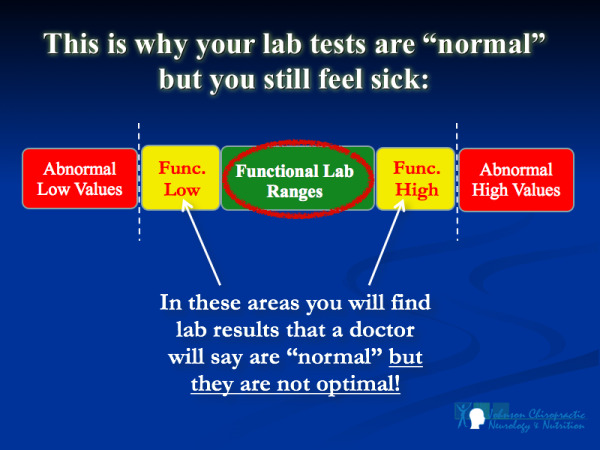 It is important to have a doctor who looks at functional ranges so you are not considered “normal” or “healthy”, because your lab tests fall in the same range as the majority of the sick people that have been to that lab. The sicker the population gets the wider, and less useful the lab reference ranges become. The main difference between health care providers who embrace or reject functional ranges basically boils down to the definition of health. Some healthcare providers define “health” as the absence of disease, and therefore if you are not diseased then you must be “healthy.” Other healthcare providers define “health” as being free of disease but also having adequate energy levels, healthy digestion, ideal physiological function, etc. Dorland’s Medical Dictionary defines health as: “A state of optimal physical, mental, and social well-being, and not merely the absence of disease and infirmity”. We use the functional range when evaluating our patients. We get incredible results with very difficult cases because we are willing to take a step back and look at the WHOLE person, not just a diagnostic label. When we see shifts out of the functional range we are going to analyze that in conjunction with a detailed history and physical examination. Glancing down at a lab report and saying everything is “normal” because all the values fall withing the “pathological reference range,” is lazy and a huge disservice to the patient. We take a Complete Functional Approach when we see patients utilizing the concepts of functional medicine, integrative medicine and functional neurology. That is why we get results with difficult neurological and endocrine disorders becasue we don’t look at things in isolation. If you would like to find out how to become a patient in our practice, then read through our site and contact us.